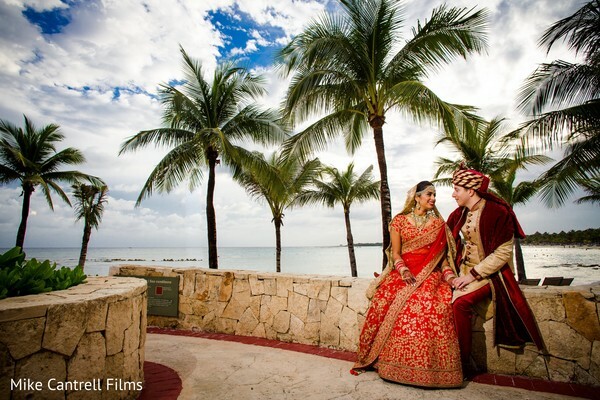 The pristine beaches of Cancun Mexico were the dream destination for Deepika and Arthur’s fusion wedding festivities! Barcelo Maya Grand Resort welcomed the sweet couple to celebrate a total of 4 fabulous events! 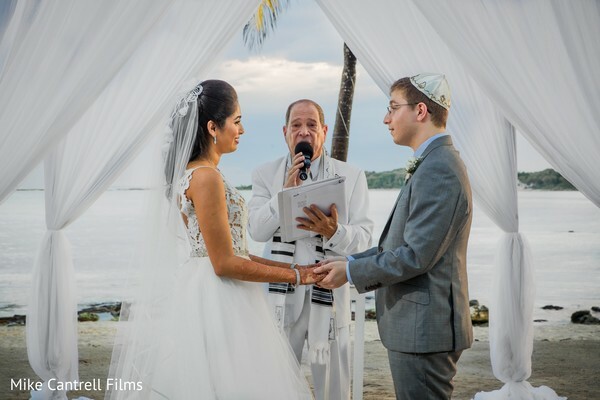 Honoring the groom’s faith, this pair had their first exchange of vows in a beachfront Jewish ceremony. Our sweet bride hit the aisle in a tulle white bridal gown and a beautiful fresh makeup by StylingTrio! 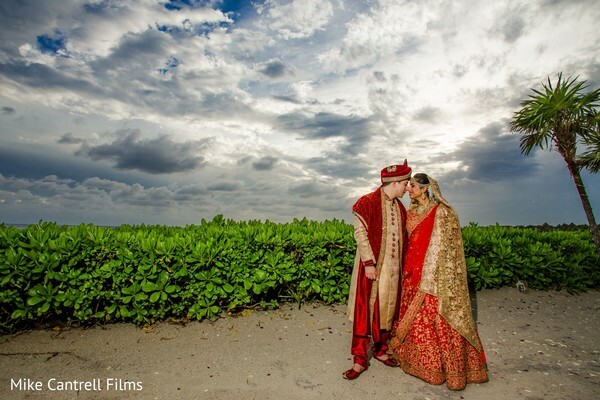 As the sun went down, Mike Cantarell Films captured Deepika and Arthur’s love during the magic of the golden hour while the guests made their way to a welcome party in honor of the newlyweds and to celebrate their first night in paradise! Next day, a fantastic Sangeet night opened the Indian celebrations and was the preamble for the Hindu blessing. 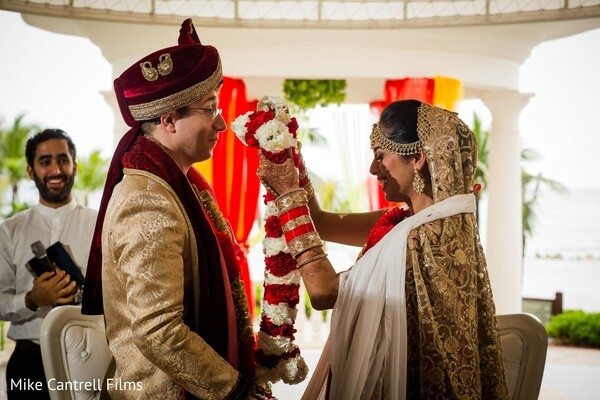 Held overlooking the crystal waters of the Mexican Caribbean, the couple paid homage to the bride’s heritage in a charming Indian wedding ceremony that bonded their lives forever! 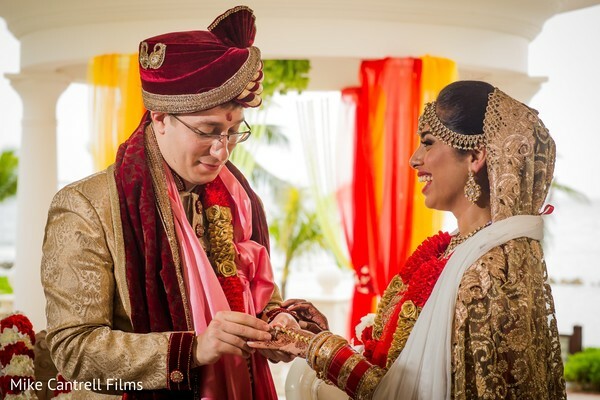 Experience how this lovely pair brought their faiths together in our full gallery and in their wedding video we featured recently in our Indian Wedding Video Blog! Arthur and I met in college through a mutual friend. It wasn't until a couple years later that we started dating but it was an instant deep connection! Arthur actually recreated one of our first (and favorite) dates for the proposal. We had dinner at Founding Farmers, a known place in DC and then he took me to the National Mall where we sat and chatted for a while before proposing. I've always known that I wanted a destination wedding, and with my family being from Brazil and his being based in the US, we decided we'd meet somewhere in the middle of the Caribbean. The planning started a year and a half before the wedding, looking at venues in different countries before setting our focus in Mexico. For the first year of planning, we were sort of on our own looking for vendors. We took recommendations from our venue, Barcelo Maya, and also from friends and family that had gotten married in the area. Overall, all of our vendors were fantastic. 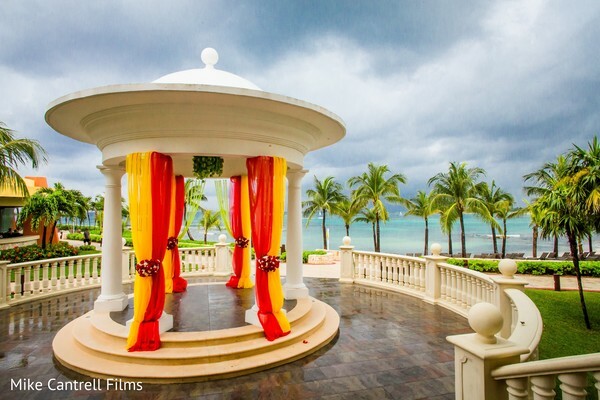 We didn't bring in Cancun Unique Weddings for the planning until around 4 months before the wedding. Joss from CUW took over after most vendors had been selected and helped us cross the finish line. For Hair, I actually brought my own stylist from Brazil. He was someone who I had known since I was 8 and always dreamed of having him do my hair on my wedding day, so it was very special to have him with me for my wedding weekend. For my bridesmaid's hair and my makeup, we worked with Styling Trio, a local hair & makeup company. They were amazing - very professional, and I loved every single look. For decor theme, I did the planning and design myself, working closely with my mom and maid of honor for the details. I had the help of CUW and Latin Asia—a decor company based in Mexico to bring the themes to life. My mehndi was done the day before all the festivities began by Lotto Mehndi, a local Mexican company. They did a beautiful job on my arms and legs with stunning details, and the ladies enjoyed getting their mehndi done during our Sangeet & Mehndi night. My wedding dress for my Jewish ceremony: I selected this from the White Dress by the Shore in Connecticut. My MIL made a private appointment for myself and family to enjoy an afternoon at the boutique. It was a wonderful experience and I settled on a beautiful off-white gown by Blush by Hayley Paige. 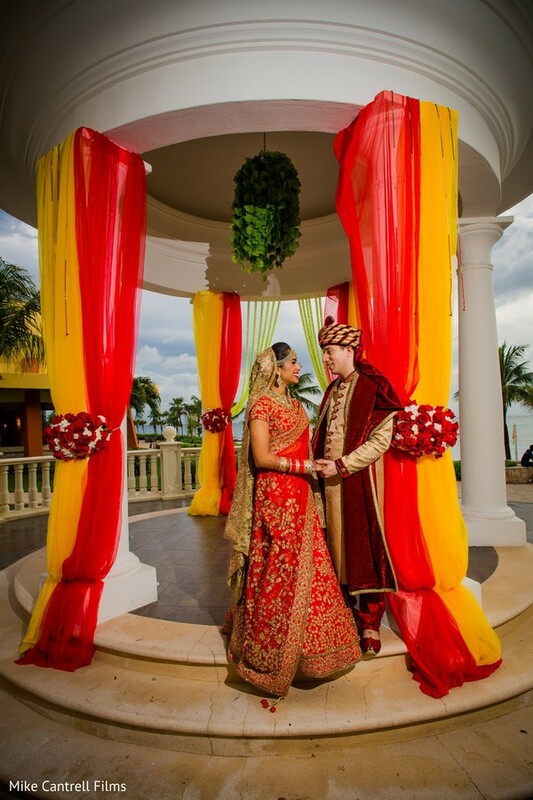 My bridal lengha was a red + gold piece I picked out with my parents from a store in Mumbai. I must've tried on at least 20 options before settling on this one. I had always pictured myself in a red lengha! I think the most enjoyable part of the planning process was the India shopping! My mom, dad, and I went to India for 8 days and got everything done. It was a whirlwind but so much fun. 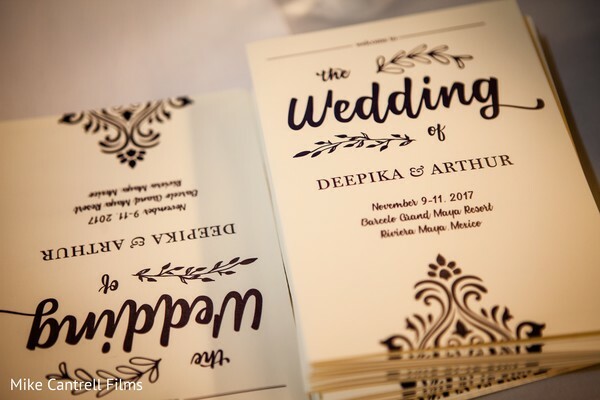 Growing up, I always looked forward to the day when I would get to explore Mumbai for wedding stuff and getting to go from the invitations place to getting the items for the puja to trying on lenghas – you can't beat it. And to have the opportunity to do that with my parents made it even more special. I think the family aspect of it is what people loved the most. As a destination wedding, the guests who joined us had to invest time, money, take time off work, and some had to travel from far to celebrate with us. It made it really special and everyone felt like a big family together. Yes - the sangeet entrance. Walking into the ballroom with my groom by my side with the dhol player and getting to see the beautiful theme come to life was really special. We could feel the love and support from our friends and family and it was a really beautiful moment. 1) Jewish Ceremony & Welcome Reception: This was on day one of the wedding. 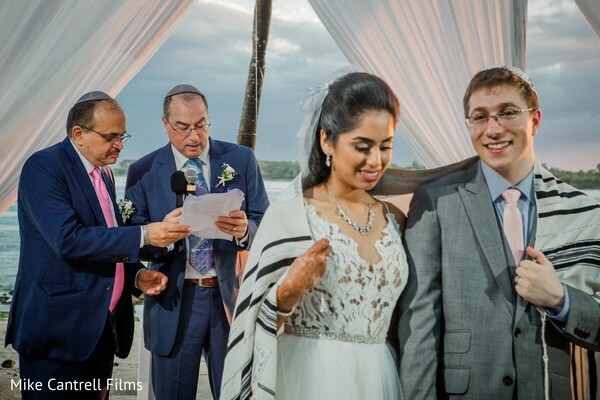 We started the evening with a Jewish ceremony on the beach (it rained 30 min prior but we got lucky!) and then did a welcome dinner that was Mexican themed. 2) Sangeet & Mehndi: We combined both events on the second night of our wedding festivities. We had dances from both sides of the family, as well as our college and work friends, got together for a few numbers. 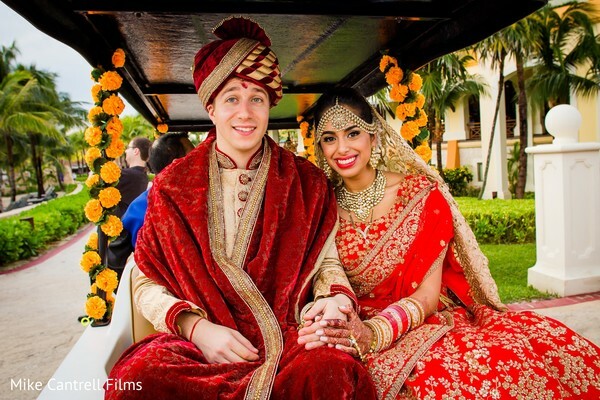 3) Hindu Ceremony: On Saturday afternoon, we had our baraat & Hindu ceremony that was outdoors. It sadly rained so we were moved to a rain site that was still outside but under cover. We had a dhol player join our DJ for two hours on the dancefloor. The guests loved it! 4) Wedding Reception: That evening we hosted a wedding reception at a beautiful ballroom at Barcelo Maya Palace. All guests were able to dance the night away to the great music by Planet DJ Productions! We had beautiful candle and hydrangea centerpieces, with a mix of rectangle and banquet tables, with gold tiffany chairs and a white vinyl dance floor. 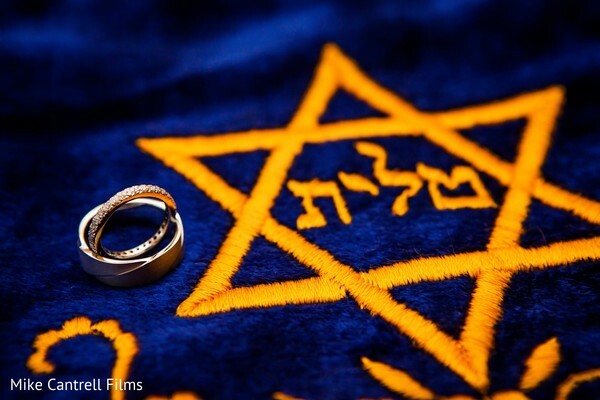 The color scheme was blue & gold—colors that are good luck in Jewish culture! 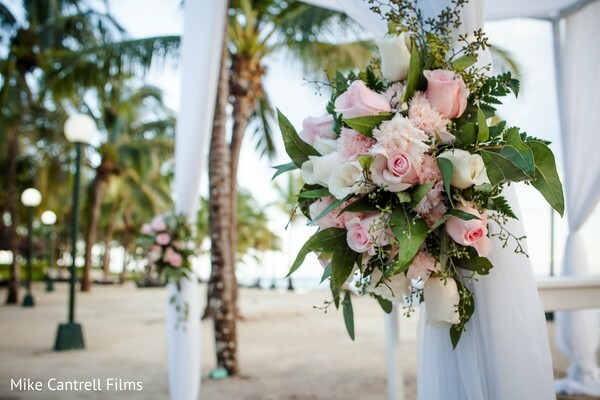 If you are doing a destination wedding, definitely hire a wedding planner with local expertise. It's really important to get someone who knows the local vendors, culture, and business practices to help you through the process. Do this early on! I waited till 4 months before the wedding and I think we would've saved significant time and money if we had brought someone on earlier to help us. While I'm Indian (and my groom is American), I grew up in Brazil so we had a few Brazilian touches added to the wedding. For the reception, we ordered what is called bem-casados (happily married)—they're a small, dulce de leche cake from Brazil that is typically served on wedding days as a small gift for all the guests. My brother also surprised me on our reception night and had Brazilian Capoeira and Samba dances to entertain the guest. Can’t wait to show you what’s next! I will be right back! Planet DJ Productions and Barcelo Maya Grand Resort are members of the Platinum Guide. Love what you see? Explore their portfolios.